These words may send shivers down the spines of the Queen’s constituents, but for me it’s a sign of rebirth. Mostly because, let’s be real, if the Queen is dead then I did a terrible job of making her choices for her. Swipe left. Swipe right. It seems so simple, until the entire country is in shambles after your body is found crushed to death under a crowd of well-wishers because the population loved you too much. All in the life, and the death, of the Queen. 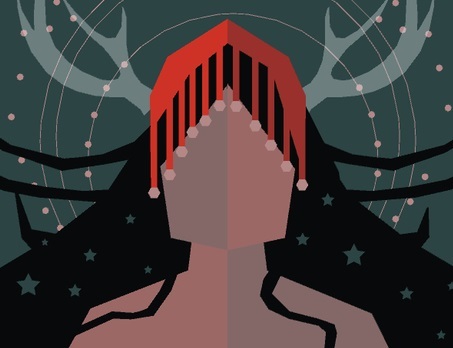 Related reading: Lindsay's review of the original Reigns on PC. 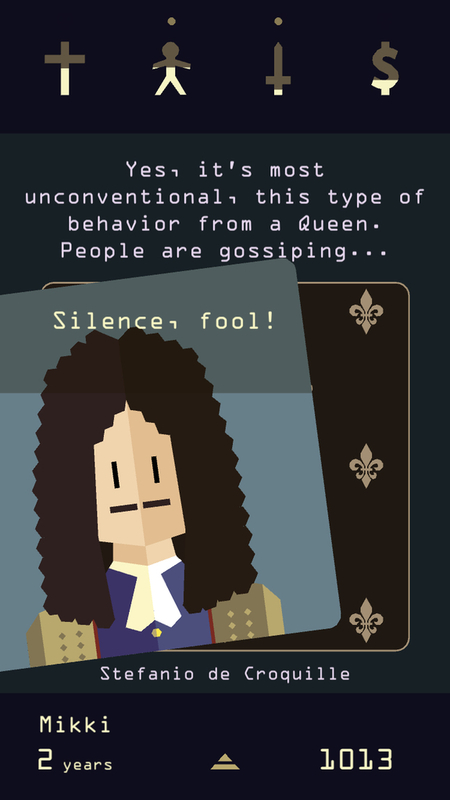 So by now you’re probably wondering what on earth I’m rambling about... unless you’ve already read my review of Reigns, you smart reader you! 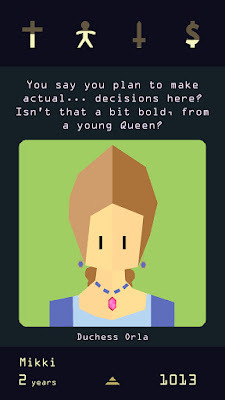 Tinder technique meets deep political unrest in Reigns: Her Majesty, the sequel to the game I loved so much I bought it for my phone after reviewing it on my computer; soon afterwards, communication between my dearly beloved and I ceased completely as we sat side by side in the evenings, each swiping to our heart’s content as he became addicted to the title. And I am prepared for this to occur again with the sequel’s release, as he’s already been trying to peek over my shoulder and asking questions that I answer with a smile and a shake of the head. He’ll find out soon enough. After Reigns, there was only one place to go: to the real ruler, to the Queen. Her Majesty focuses on one country’s line of queens, generation after generation, star sign after star sign. She must balance her country’s religious, population, military, and financial needs. Swipe one way without letting go to see that option, and move your finger the other way to see the second. Let go in either direction to make the call. What I find fascinating about Her Majesty is that since there is a ton of new content (oh, the cards!) there is a lot more game to get through, and eventually I got complacent in my swiping. There will always be a new Queen who starts with brand new, perfectly balanced stats, so what do my choices really matter? The honest answer is that to get through the cards, you need to play the cards. Odds are reset with each new Queen, so the best path to total clarity is through careful thought, planning, and a little luck of the stars on your side. 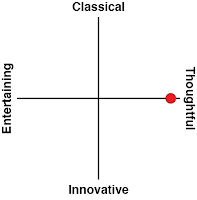 Star signs is something new in Her Majesty when compared to Reigns, as are items. Each Queen will have a given star sign, visible at her beginning. Cards sometimes appear with a star sign in the corner – hint, hint, hint. Items are gathered throughout the game, sometimes being upgraded to a different one in the same space. Things like perfume and a spellbook will become invaluable to your progress as Queen. I have a terrible memory so I tent to instantly forget what I’m told, making star signs and items more of a memory test than anything else for me... but that doesn’t mean I don’t see the appeal. I do. It just takes me a little longer to get from A to B.
I’d like to take a moment to absolutely rave about the game’s narrative. 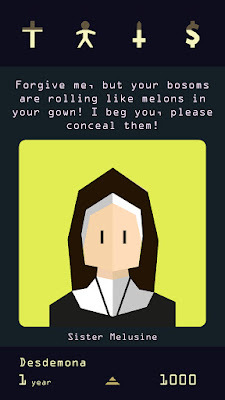 Written by Leigh Alexander, Her Majesty adds a funny-yet-real feminist take to the original game. A nun tells me to conceal my bosoms, which are “rolling like melons” in my gown. A duchess questions my decision to make decisions, calling it “bold.” My very own husband jokes that I’d have to be a God to have power in his kingdom. Time after time, these are little quips and jabs at the Queen being a woman, or a young woman, or a powerful woman, just to knock her down a peg. But my Queen won’t fall, thanks to Her Majesty’s narrative turns. She’ll learn. She’ll transform. She’ll make mistakes. But she won’t back down. So what does happen if one of your country’s four needs bottoms (or tops) out? You die. The people are too happy? Dead Queen. Too rich of a country? Dead Queen. Church or military takeover? Very obviously dead Queen. But keeping your eye on those stats while trying to make decisions is easier said than done, and while you see which will be affected while “soft-swiping” (what I call swipe without release) you won’t know how. It’s a bit of remembering your past lives combined with seriously contemplating actual outcomes that gave me the most success, but even then my Queens only rule for 20-25 years in general. 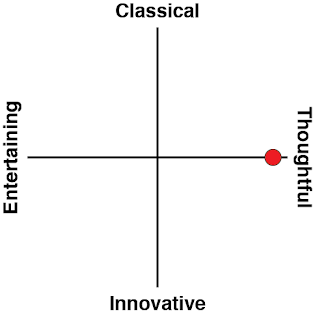 It seems like an impossible task to do better, although I’m extremely sure that most people do. But don’t worry, I’ll keep swiping and get there eventually! The Queen is led from afar by All Mother, a deer-like goddess who lives in the woods and allows your spirit to move from one generation of Queen to the next. A woman named Lys, who I am now in love with, is the link between the Queen and All Mother, giving advice and bringing messages from the Forest. The military and the church are afraid of All Mother, and will throw Lys under the bus at every chance. My poor, innocent, beautiful flower mistress, she’s done nothing wrong! We all have the same goal: eternal love and peace for all. Is that so damn hard?! Before my final thoughts, one more thing: the haptic feedback is amazing. When the All Mother appears the screen goes kind of glitchy, which vibrations matching perfectly as the screen flickers. It seems small, but sometimes the small things make a big difference. Swipe left: love Her Majesty. Swipe right: love Her Majesty. Get lost in a maze: still love it. 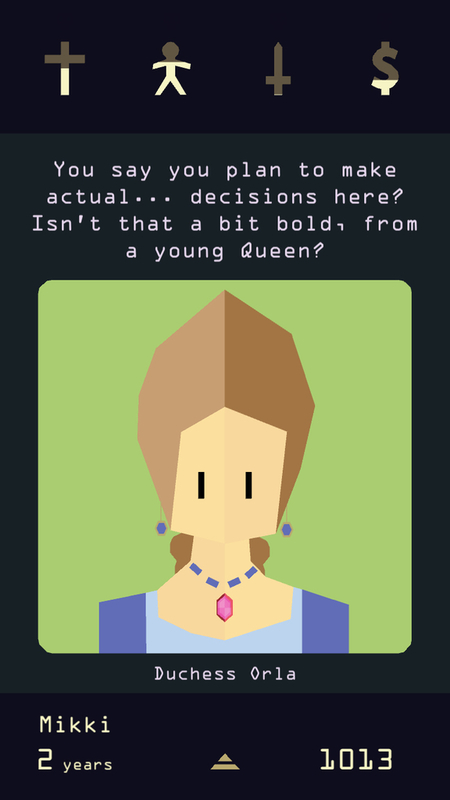 Of course it looks easy, what with the Tinder-based gameplay and all, but Her Majesty is a deceivingly complex look at what it takes to balance the needs of an entire kingdom. It’s available on PC as well, but after playing Reigns on both mobile and PC I cannot recommend the mobile version enough. It’s simple enough to pick up and play while waiting for the bus, yet also deep enough to put in marathon sessions when you should be asleep.